This book was sent to me ahead of its release and I have to say that it's really stayed with me. Niven Govinden was completely unknown to me prior to this, though I will certainly be looking up his other novels. All the Days and Nights is set on the East Coast of America in 1980 and explores the relationship between artist Anna Brown and her husband and muse, John. As Anna denies that she's dying, her focus becomes consumed by her final paintings and she is desperate to capture something essential about life. Meanwhile, John disappears across country seeking out the portraits of himself as he considers the life he has led. As their stories unfold independently, the complex truth of their relationship comes to light. This is a book for people who appreciate the poetry of language. Govinden's word choices are by turns beautiful and profound. He captures the isolation of the lives of artist and muse in America, alongside the often unwelcome intrusion of gallery openings and publicity. We come to understand how Anna's work possesses her and how John copes calmly with her demands. Written in the second person, there is an intimacy conveyed in this work which it is difficult not to become absorbed by. 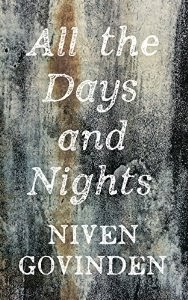 In brief vignettes of a couples' life together the author delicately explores themes of loss, love, beauty, and death. The result is a novel which is melancholic and deeply moving. One is reminded of the power of great writing as each word completely belongs in the sentence in which it's placed. All the Days and Nights deserves to get a lot of attention.